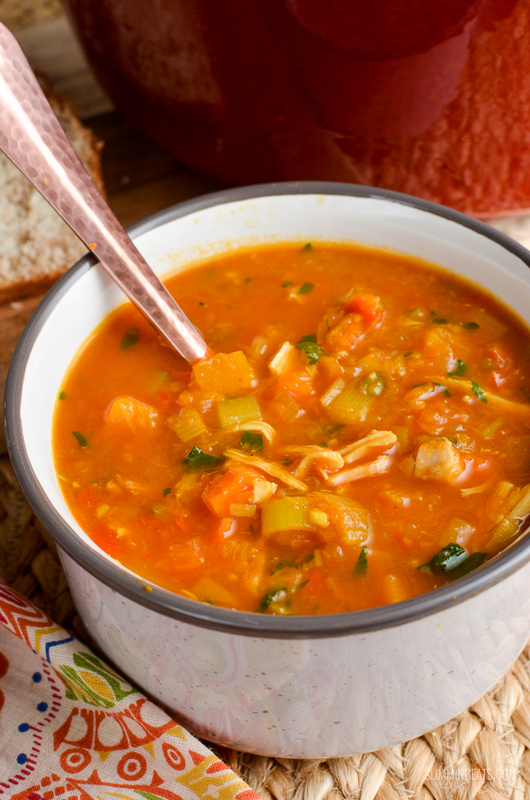 This delicious bowl of Spicy Chicken and Vegetable Soup is packed with healthy vegetables, amazing flavour and is really easy to make. The only hard part is chopping the vegetables. This time of year I can’t get enough of soup. It’s warming, filling and a great way to get that 5 a day of vegetables. I make at least one pot a week this time of year because I am often busy and if I want to stay on plan, I need to have something on hand that I can heat up quickly for lunch or dinner. Soup really doesn’t need to be boring either, you can combine some amazing ingredients to make a delicious complete meal in a bowl or if your soup is pretty basic, top with some yummy toppings to bring it up another level. 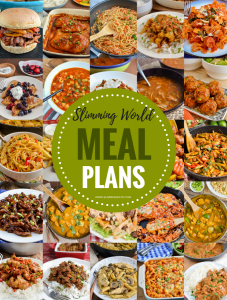 Some of my favourite toppings to add to soup to turn it into a filling meal, is some cooked protein, like chicken, sausage, meatballs, ground meat or for a veggie option, I like crispy kale, sauteed chickpeas, roasted butternut squash or sweet potato. So many possibilities for yummy toppings. You could even add in some cooked pasta, rice, beans or lentils. Doesn’t have to be a huge serving, just a small amount that will bulk it out and make it more filling is plenty. You could even top with some grated cheese as part of your healthy extra A choice if it is a soup that would be complemented well by some grated cheddar, parmesan or feta. Yum!! 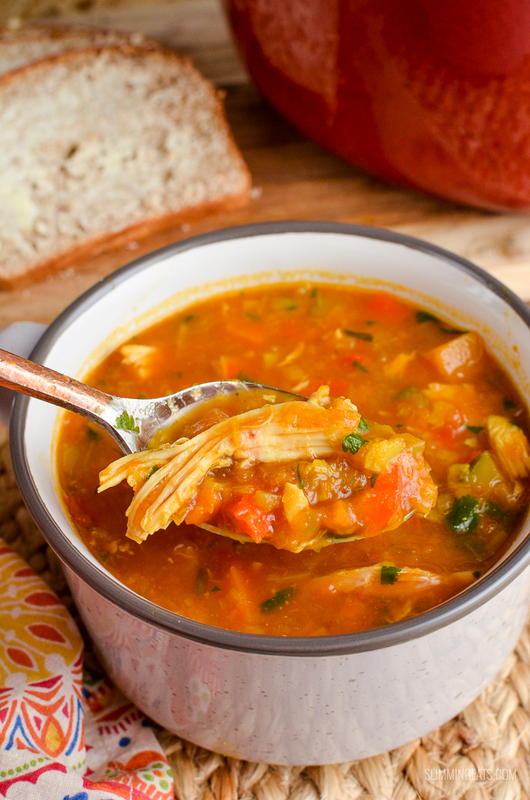 This spicy chicken and vegetable soup, is a great way to use up some leftover cooked chicken from Sunday dinner, or it would even work well with leftover cooked turkey at Christmas, you are not adding the chicken, until the very last minute, so no need to worry about it being overcooked and dry. It literally is just a case of stirring it in it. 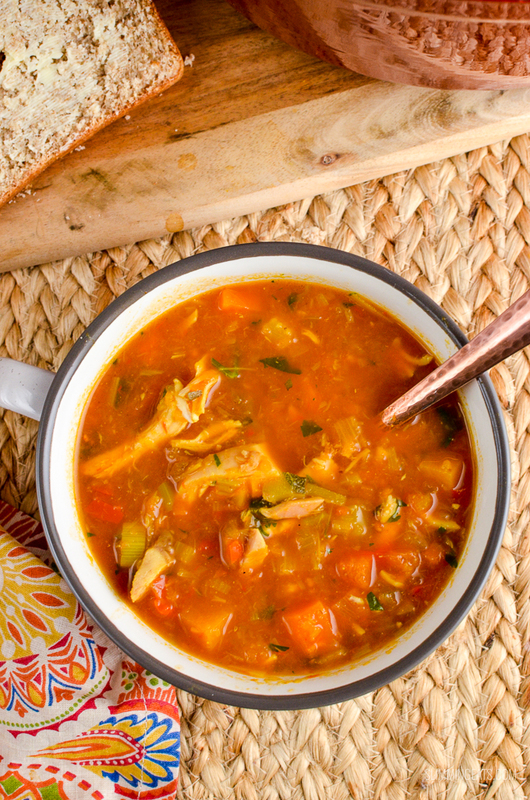 Often when I make my Slow Cooked Chicken, I will use the leftovers to make this soup, as my kids love it, and I know it’s a way of getting them to eat all those good veggies. Sometimes they can be a bit picky about having just plain vegetables on their plate, but in a soup, they will literally eat anything. You can control the amount of spice too, by how much cayenne pepper you add, if you like it really spicy, add a little more, to your desired heat. 1/4 of a tsp is just the right amount for us, a small kick of heat without being overpowering. We like our soup to keep some chunks of vegetables, so I just add in my Immersion Stick Blender like this Koölle Electric Powerful 3-in-1 800 Watt Hand Stick Blender to the pot before I add in the chicken and coriander (cilantro) and roughly blend. What that does is thickens up the soup, but not to the point that it resembles baby food. 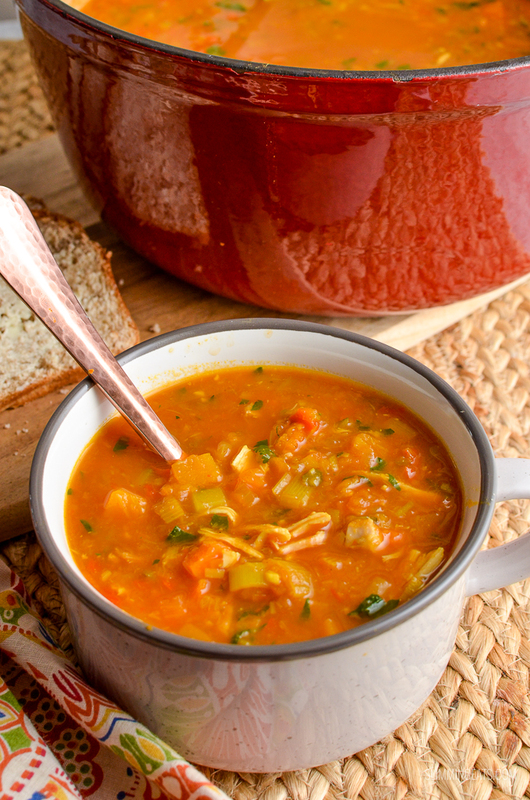 Smooth soups have their place, but this one is far better with some little pieces of vegetables, trust me on that one!! If you only have a regular blender, I recommend adding half the soup to the blender, then you can blitz that amount till smooth and stir it back into the rest of the soup before adding the chicken. 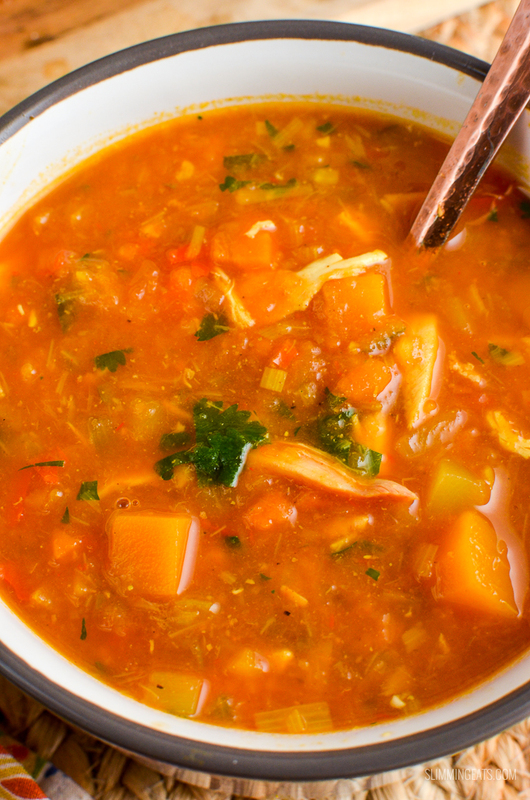 I made a big pot of this Spicy Chicken and Vegetable Soup this week, so it was perfect for quick meals. It’s Thanksgiving today in the US, which means tomorrow is Black Friday here in Canada and I always hit the shops for the sales. I know, I know call me crazy, but the crowds don’t bother me, it actually feels rather festive seeing everyone out doing their Christmas shopping and some of my favourite stores are not too busy. So this soup will be perfect for heating up for dinner when I get in. This soup can also be made in an Instant Pot or pressure cooker and I will put instructions for that below too. It is the best kitchen gadget I have purchased. It is basically a 7in1 cooker, and it slow cooks, pressure cooks, saute’s, has settings for soup, chilli, rice, porridge and even makes yoghurt (I haven’t tried that yet). 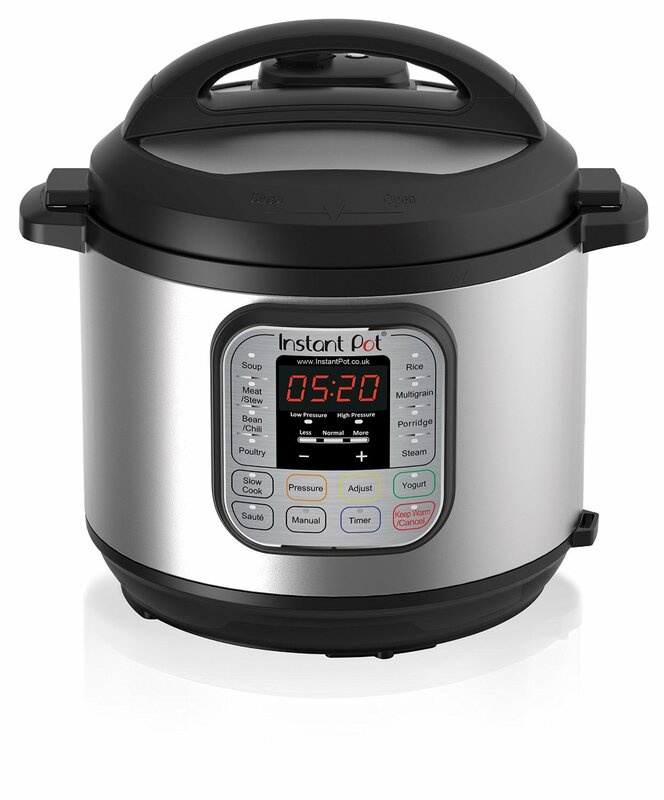 Instant Pots often go on sale on Amazon over Black Friday and Cyber Monday, so if you really want one, keep your eye out for a price drop. Why not get a pot of this going on the stove or in your pressure cooker today, you will love having this on hand to heat up, trust me. 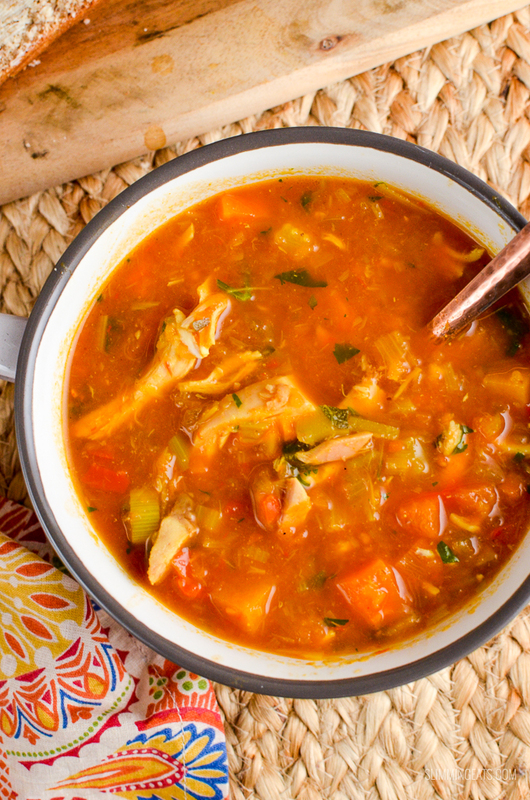 What kitchen items do I need to make this Syn Free Spicy Chicken and Vegetable Soup? Add a little bit of stock (approx 1/4 cup - 60ml), and reduce it down, till onions, leeks are translucent. Add the butternut squash, red pepper and zucchini. Add the passata and stock. Add the chicken and cilantro (coriander), and mix to combine, stirring till heated through. Season with salt and pepper, add a 1/4 cup of stock and fry till onion and leeks are translucent. Add in the garlic, ginger, butternut squash, pepper, zucchini, spices, passata and remaining stock. Set to high pressure for 10 mins. Set to saute mode, add the cooked chicken and cilantro and stir till heated through. 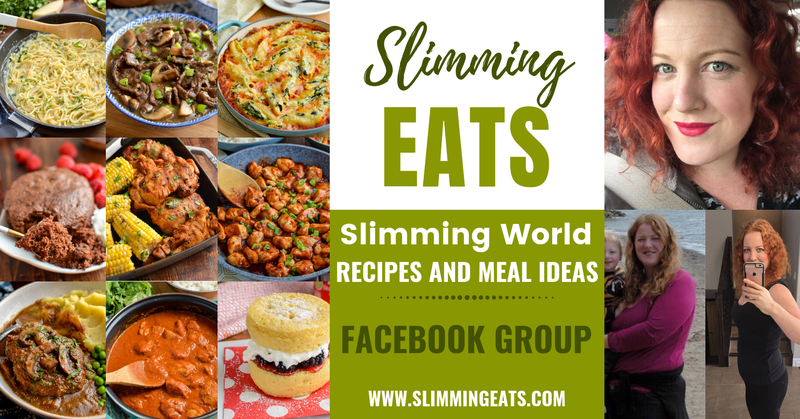 Love all your recipes, thanks for posting such a wonderful variety! When I made this soup I thought it far too spicy I’m afraid. I added extra vegetables (almost double the original quantity) and an extra litre of stock but it was still very spicy. On looking at the recipe I wondered whether it was correct at 1 TBSP ea of cumin and coriander or should it have been less? This is the only recipe I’ve made (and I’ve made loads as they save me having to adapt my own!) that I’ve had a problem with – probably just me and my family but I thought I’d ask anyway! Hi Pat, yes measurements for those are correct, cumin and coriander are actually not spicy. I can only assume you went a little too heavy on the pinch of cayenne.